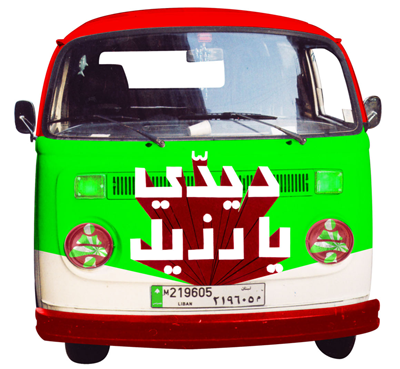 In this piece Arabic slogans sung to the tunes of children nursery rhymes are painted (in Photoshop) on a Volkswagen van. The van came as a response to the demonstrations that united all the religious sects in Lebanon in protest against the assassination of former Vice-President Rafik Hariri. The van would drive in Downtown Beirut around the assassination scene, while blasting the slogans and selling recordings of the music. In this piece Arabic slogans sung to the tunes of children nursery rhymes are painted on a Volkswagen van. 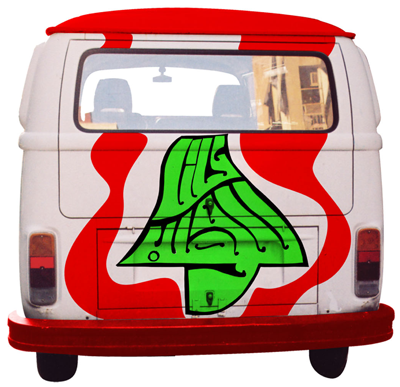 The van came as a response to the demonstrations that united all the religious sects in Lebanon in protest in 2005.